There’s a reason we all scream for ice cream—it’s just that good! Add in homemade versions and friendly service, and you’re looking at a real winner. 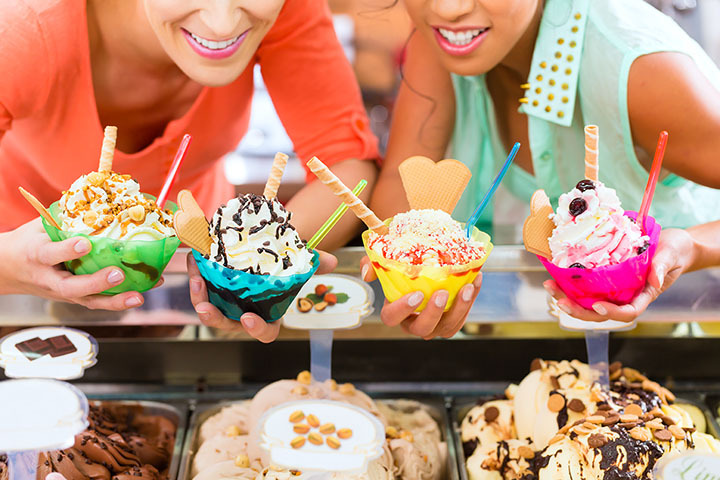 Whether you’re wanting to cool down, pass time on a rainy afternoon, or just eat something downright delicious, the ice cream parlors of New Jersey are second to none. Grab a scoop or two (or three), and be transported to carefree summer days when you’re biggest problem was a melty, dripping cone. Hoffman’s has expanded to four New Jersey locations, but their all-natural ice cream is lovingly crafted at their flagship Point Pleasant Beach location. Can’t make it into their brick-and-mortars? Consider renting an ice cream truck for a party, or even having their nearly-sinful creations shipped right to your home. Visit for familiar childhood favorites, and inventive seasonal offerings. With over 60 scoopable varieties, and 11 dreamy, soft-serve options, Cliff’s has been a New Jersey institution since 1975. Whether you stop in for a scoop, or order your very own pushcart sundae bar for an event, this Ledgewood location is a star. Not only a neighborhood favorite, Cliff’s has won multiple national retail awards for various flavors. Beloved for more than half a century, Curly’s is a widely known New Jersey name with three delicious locations. With a focus on quality ingredients and a courteous staff, Curly’s has maintained a well-earned reputation for integrity at all levels. Visit for a tasty treat, done the old fashioned way. TK’s is a seasonal stunner with retro appeal. Family owned and operated, this Cream Ridge location boasts a lovely patio, with oldies playing in the air and a huge variety of flavors to choose from. Load up the kids, grab plenty of napkins, and make lasting, summertime memories at this wholesome winner. Plenty of ice cream joints can claim farm-to-spoon freshness of ingredients and family-oriented ownership but few can double down on both like the folks at Applegate Farm. This Montclair favorite has been providing quality dairy products since 1848, and its ice cream is no exception. A visit to Applegate Farm is as informative as it is delicious, as the original farmhouse was itself a part of the Underground Railroad, and the rare, tile silo dates to 1919. An enduring, mouthwatering piece of state history. You may recognize the Holsten’s moniker from the very last scene of hit television show “The Sopranos,” but the quality of both product and service at this Bloomfield bombshell easily hold their own in the spotlight. Recently celebrating 75 years of making ice cream dreams come true, this Garden State favorite sells not only top notch ice cream, but other delightful confections and a substantial, savory selection from breakfast standards to burgers. This one time deli transformed into an ice cream sensation thanks to the very specific pregnancy cravings of owner Pura Berrios, when husband Peter bought an ice cream machine to hand create what his wife longed for, and Jersey City is all the more tasty thanks to it. Decades later, this family run favorite boasts over 65 varieties, including unconventional creations like avocado. With more than 10 varieties of delicious sundaes available, and truly swoon-worthy pretzel cones, Springer’s serves up some of the tastiest combos in state. Visit for more than fifty flavors of old fashioned joy, and exciting dishes like banana splits. A seasonal favorite, Van Dyk’s has delighted generations of satisfied patrons with quality, time tested recipes. Staffed primarily by local teens who make quick work of the famously long lines, this Ridgewood staple returns just as strong, season after season. Zita’s is all about quality and variety, with a sizable selection spanning classic hard flavors, seasonal treats, Italian ices, soft serve, and even frozen yogurt. All this before you even reach the long lists of wet and dry toppings available! Visit for throwback treats and a family-friendly atmosphere.